The nSTS-E is an adapter for Samsung tablets* that features wired Ethernet connectivity, Simulcharge technology that lets tablets to operate as a USB Host controller while simultaneously being charged, and the newest LAVA development adds Docking Detect for automatic tablet and LAVA board connection. The adapter uses a USB power supply provided with the tablet. The nSTS-E operates a tablet in SimulCharge mode. This technology allows the charging of the selected Samsung tablets while interacting with USB accessories. 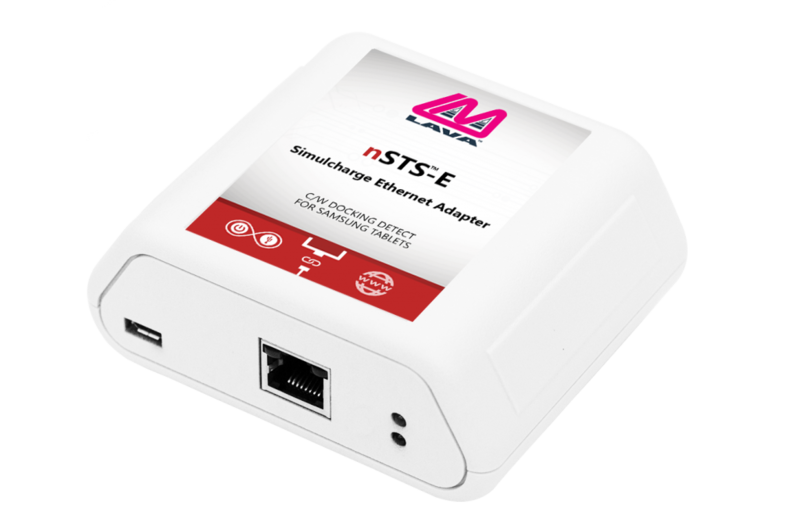 The nSTS-E features a 10/100 Fast Ethernet interface that enhances the reliability and security of the internet connection. The Samsung tablet can use the dynamic address (DHCP) or static address for the network communication.